In a dramatic move, John McCain announced today that he was going to suspend his campaign in a last ditch effort to save his campaign. McCain called upon Barack Obama to honor his "state of emergency" and also suspend campaigning, but doubted that Obama would do so because Obama failed to put "country first" -- and also, McCain said, because Obama is an Arab terrorist. "And a fine, decent family man with whom I have disagreements," he added. "And a crazy Muslim." McCain's campaign has been described by critics and supporters alike as a total disaster. "Others would continue their campaigns under these conditions, but that's not what a maverick would do," McCain told reporters. "This is why I'm not popular in Washington." Others disagreed, saying McCain was not popular in Washington because of his unsightly nose hairs and what some called his "increasingly uncontrollable jowls," among other things. McCain reiterated his latest campaign slogan, saying that he was "not afraid to fight," and that "America needs a real fighter right now," but that "it takes a real fighter to stop fighting because sometimes not fighting is more effective fighting than actually fighting." At that point, aides grabbed McCain and threw him headfirst into a waiting limousine. 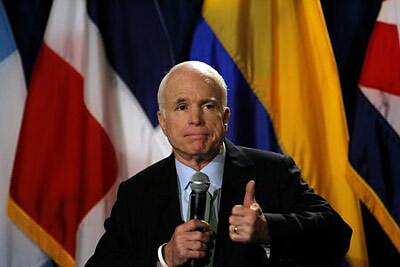 Supporters applauded McCain's bold choice, saying that the candidate needed to act because things looked so dire. "He's not running for Miss Congeniality," said supporter John Gaffney of Ohio. "Although I can understand that to some outsiders it looks that way." 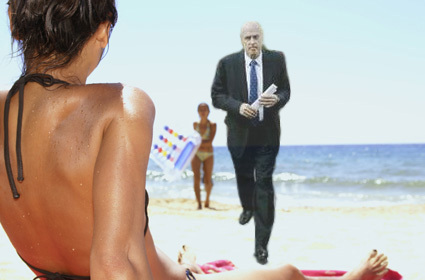 Anonymous tipsters claimed to have spotted Secretary of the Treasury Henry Paulson earlier today on a secluded tropical island. The FBI confirmed today that Paulson left the country early yesterday afternoon with what JetBlue Airlines called "countless heavy, fully stuffed duffel bags." There were so many duffel bags that Paulson paid thousands of dollars in excess luggage charges "without batting an eyelash," a JetBlue Airline official said. The White House hastily released a statement Sunday afternoon saying that Paulson had "taken a brief vacation," and claimed that mobilization of a vast number of Air Force search jets over the entire Pacific was "just a military exercise." Nonetheless an unusual number of comings and goings at the White House and on Capitol Hill conveyed an air of panic. An anonymous source claimed that Paulson had left a note in which he stated that he had concluded that "the American economy is no longer viable: I am going to make my own." President Bush refused to confirm that such a note existed, saying only that on Sunday, he rarely reads, but that "he would check his desk first thing Monday." Lawmakers were putting together what they called an "emergency emergency" $350 billion "replacement" bill, which they promised would include even more oversight. "This time we're using electronic monitoring," promised Rep. Barney Frank. In other news, an unidentified bidder purchased the countries of Mauritius, Belize, and Tahiti as what he called "second homes." Sarah Palin, plagued by polls indicating her dropping popularity and interviews with Katie Couric where she was so beleagured that she made Dan Quayle look brilliant by comparison, did an impression of comedian Tina Fey impersonating Sarah Palin at last night's Vice Presidential debate so that she could be "even more folksier and plain spoken." Palin explained her affinity for Fey, who now regularly returns to Saturday Night Live to play Palin. "You know what I like about Tina?" Palin said, smiling and winking at reporters. "She's a mav-rick, you betcha." Palin then extended her middle fingers and thumbs, pretending her hands were guns, and said "pyeuw!, pyeuw!" while making shooting gestures at the corners of the room. Tina Fey had done the same thing last Saturday on NBC, but used her forefingers. "I think middle fingers are more direct," explained Palin. "It's more the John McCain way." Viewers were impressed with Palin's performance at the debate, some remarking how awestruck they were at the vitality of Palin's impersonation. "She really captured Tina Fey," said one viewer, an undecided voter from Allegheny, Pa. "I'm thinking of voting for her." During last night's debate, Palin answered questions on topics ranging from the bailout of the domestic economy and U.S. military intervention overseas by repeatedly saying "Energy!" and "Mav-rick, dontcha know!" and winking at the camera. Some viewers were not impressed by Palin's performance, however. "She didn't seem to really be answering the questions," said Floyd McGilla of Spitzen, Montana. "I think she need some of Tina fey's writers."